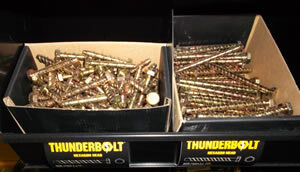 Thunderbolts are an excellent way of fixing many differing components to concrete, brickwork, blockwork, timber and pavement. They work by cutting their own way into a pre drilled hole. They are very hard and are able to be screwed into hardened concrete and brick walls and floors. The best way of screwing them in is by using a socket and ratchet or bar. They are ideal for fixing timber wall plates to walls when hanging a gate or fence panel. They are also the most popular way of fastening down metpost type bolt down sockets. West Country Fencing Supplies sell nails of most sizes and types. They are sold in bags of 500g and 1kgs, buckets of 5kgs and 10kgs to boxes of 25kgs. All nails are hot dipped galvanised. Which are best for the nature of outdoor treated timber environments. We also sell strip collated nails with gas canisters included these are compatible with the Paslode type nail guns. For what suits your project best, we are more than happy to discuss your requirements. West Country Fencing Supplies, are stockists of Birkdale Ironmongery. I have been selling Birkdale gate fittings, ironmongery, Gatemate and Fencemate for many years now and have always been very pleased with the standard of quality ,service, value for money on all the components. Birkdale have a continuous improvement and innovation throughout their range. I have full confidence in their products and believe that Birkdale offer the best value for money and can provide next day service for special items that need ordering. The adjustable gate hinge set is a must when hanging large 5 bar or field gates as most gates that are wider than 4ft/1220mm will drop slightly under their own weight or due to ground movement over time. There is nothing worse than the stark image of a pair of 5 bar gates across a driveway that are uneven and cannot be adjusted to be level again. The adjustable gate hinge set range from Birkdale, do this very well. There are also adjustable hook and band hinges available too. For any further information on how to make a gate adjustable, please give us a call to discuss options.